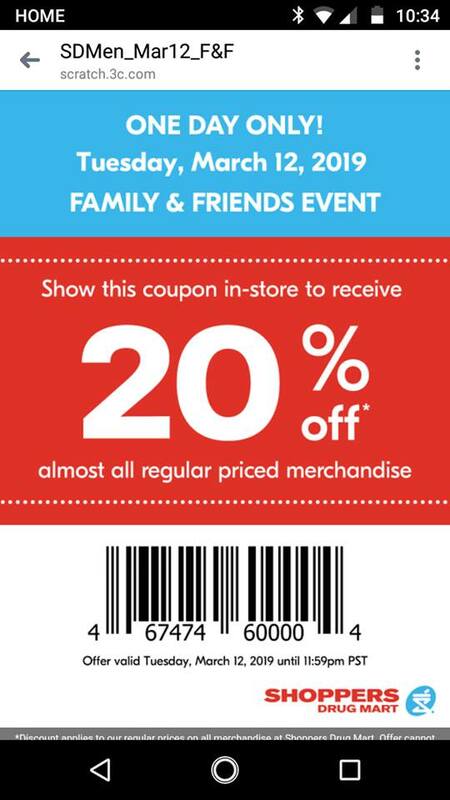 Tomorrow only at Shopper Drug Mart Canada, get 20% off regularly priced merchandise during the Friend’s & Family event. Present this coupon on Tuesday, March the 12th, and the offer will be applied to your purchase. This coupon was sent out by text, but if you are not subscribed to receive them from Shoppers Drug Mart Canada, you can still use a screenshot of the image in this post and present that to be scanned at the register. The bar code is the same for everyone who did receive it. 20% off of regular price may not be the best of deals at Shoppers Drug Mart, but there are plenty of regular priced items with bonus points attached. If you have any personal offers and can also get in store bonus points, combined with the 20% off it’s worth taking a look at the flyer and then checking your offers.